Back in the day when all photos were printed, only the lucky ones got well cared for by being placed in a photo album, while the remainder were probably placed in a shoe box. As a child, I remember playing with a drawer in the side board in the sitting room full to the brim with B&W photos of all shapes and sizes. Over time, all photos will fade due to a degrading chemical process, but those that haven’t been cared for will have been handled many times over the years and become brittle, torn and damaged. 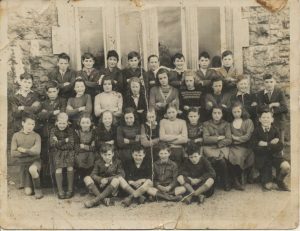 These photos are now often Gold Dust to the next generation and are a great help at piecing together a family history.We do a lot of old photo restoration. Everyday, we receive old damaged and faded photos which we restore and reprint, giving them and the associated story a new lease of life. 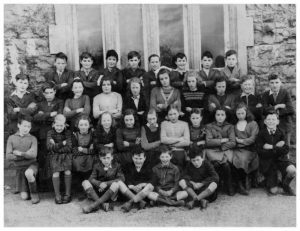 Here, we show a few examples of some old photo restoration work we have completed recently, including this old School group B & W photo from Geashill NS 1950. In this video , we show a few examples of completed work and demonstrate what is possible by old photo restoration in both B & W and colour photos. In most cases we can achieve the best results by printing a new restored photo as the same size of the original photo, but if the quality is good enough, it may be possible to print a new enlarged photo , or indeed another printed product…eg Canvas etc. Do you have some old neglected photos stored away somewhere in your House ? We welcome all Old Photo Restoration assignments.